When it comes to our relationship with technology, most people think in terms of the classic struggle between inventors that capture the imagination and laborers that don’t want to be imagination-captured right out of a steady paycheck. I think this is a rather obvious way to consider technology in our lives, but that there’s another dimension that sort of kicks in as an “aha” moment in much the same way that a line between “left” and “right” politically is trumped by the political compass quadrant system that also addresses libertarianism vs authoritarianism. 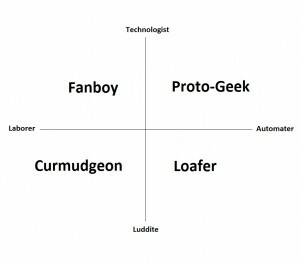 Towards that end, I propose quadrants related to technology. On one axis, there is the line from Luddite to Technologist. This is the line along which enjoyment of technology ranges when it comes to aesthetics and emotions. Luddites have a visceral dislike for technology, often because it makes them feel insecure or afraid (e.g. laborers in a factory who are about to be replaced by robots). Technologists have an emotional connection with technological advancement, generally because they find change and new possibilities exciting and intriguing (e.g. people that read about scientific advances, hobbyists that build robots, etc.). On the other axis, there is a range from Laborer to Automater. Along this line, applied and practical interaction with technology varies. The Laborer will have little opportunity and/or motivation to use technology to automate day-to-day tasks (e.g. an artisan or a member of a think tank). Automaters embrace optimizations brought about through the use of technology and will typically seek to be as efficient as possible. People at this end of the spectrum value technology in a pragmatic sort of way, using it as well as process to optimize for time, cost, etc. People who use mobile devices to track appointments and tasks to the point of hyper-organization are good examples. These two axes yield the following graph, with labeled quadrants. “Fanboy” is the set of people that enjoy technology for its aesthetics and have a concept of tech-chic. These are people who will buy something like a cell phone for an accessory more so than for the various practical purposes of automating parts of their lives such as the aforementioned task tracking and organization. Non-technical gamers may also fall in this quadrant. 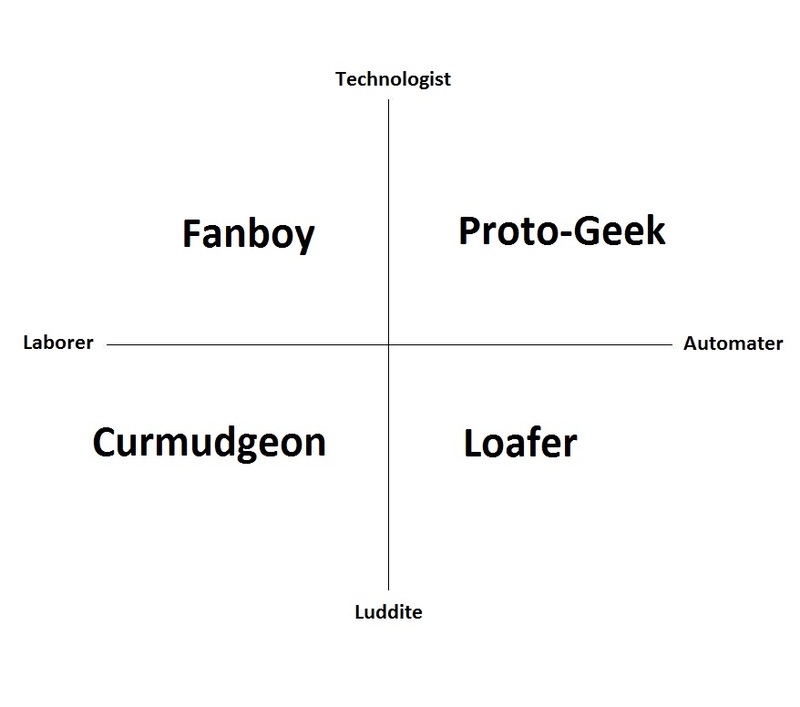 The other less commonly considered quadrant is the Loafer, who prefers to automate things in life but has no love for new technologies and techniques. Contradictory as this may seem, it’s actually relatively common. And worse, it’s toxic to your software development group. To understand the problem, it’s essential to understand what makes the Loafer tick. First of all, the Loafer isn’t a malingerer in the sense that he’ll shirk his responsibilities or do work that is of inferior quality. Rather, the Loafer seeks to optimize efficiency so that the value proposition of doing work is improved. In other words, if you task a Loafer with alphabetizing a list of 50,000 names, he’ll write a program to do it because that gets the job done more quickly. He’ll charge you the same rate regardless of methodology, though, so he’s automating specifically to allow himself more free time (or profit, as it were). Proto-Geeks view automation as having a high cool factor. This is in contrast to Loafer, who views it as having a high profit factor. But why is this a detriment to your group? After all, it stands to reason that Loafer has the best business sense. It seems as though it’d be important to have people on the team that chose the best tool for the job rather than because they were simply excited to use it. And that is true. The problem is that Automaters further down the chart toward Luddite are operating in a way to maximize their own personal efficiency and profit, rather than the group’s. Most Loafers in a software group don’t particularly like what they do, but they know that if they do more of it faster, they get more money–or more time to, well, Loaf. So once they find a set of tools, languages, frameworks, etc. and become facile with them, they’re not only disinterested in new technologies–they’re actively resistant. Loafers want nothing more than to continue to solve all problems that come their way as quickly and with as little effort as possible, but with a locally-maximizing, greedy approach; investing a lot of extra effort in the shorter term to learn new ways of doing things more efficiently down the road is not appealing. If you have one or two Loafers in your group, they can serve the useful purpose as natural conservatives that prevent Proto-Geeks from running buck-wild with new techs and frameworks. But this dynamic must be carefully monitored, like an inoculation, since the proportions can quickly become toxic. Tip the group’s dynamic a little too far into the Loafer quadrant and suddenly you have a bad case of “not invented here” and complete resistance to new ideas. There’s also frequently a strong correlation between Loafers and Expert Beginnerism; established Loafers often have a track record of some success with their approach and thus a powerful, built-in argument for inertia and the status quo. And finally, Loafers tend to kill enthusiasm for learning pretty quickly since presentation of new technologies is met with sarcasm, skepticism, and derision, making it essentially uncool to learn and embrace new things lest one be accused naivete or being some kind of shill. 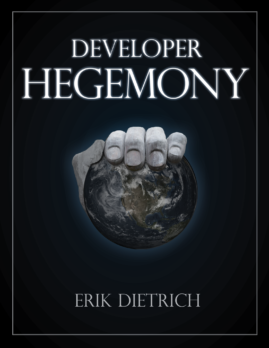 If you’re in a position of authority within a group and recognize a Loafer dynamic, I’d suggest shaking things up to see if you can re-awaken or inspire a Technologist in some of them. Or perhaps you can infuse the group with some fresh-faced Proto-Geeks. If, on the other hand, you’re a powerless Proto-Geek in a Loafer group, you have a range of options from persuasion to proof-of-concept pitches to management to dusting off your resume. In either case, I think it’s important to recognize your surroundings and to try to seek out the quadrant in which you’re most comfortable.